Gentle next to skin, tough on stains. Suitable for sensitive skin. Use with Comfort Pure for everyday kindness. British Skin Foundation recognises Persil?s research into skin care and it is accredited by Netmums. Dermatologically tested. 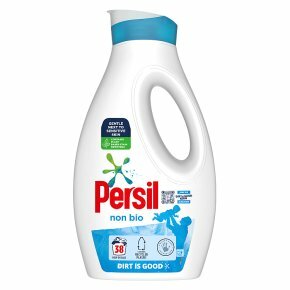 Have you tried the full Persil Non Bio range? Also available in powder, capsules and powergems. For a laundry detergent that?s gentle next to skin and tough on stains, look no further: Persil Non-Bio Liquid Detergent combines both of these qualities in one handy bottle. Packaged in a convenient flip top bottle with a pouring spout, Persil liquid laundry detergent is quick and simple to use. Persil liquid also comes with a free Stain Eraser Dosing Ball to make pre-treating stains easy. Persil non-bio cleans tough stains like oil and Ribena while leaving clothes kind next to skin. As a non-bio detergent without enzymes, it is specially designed to be suitable for those with sensitive skin. Persil?s skin care research is recognised by the British Skin Foundation, so you can be sure that Persil non-bio will be gentle next to skin. Dosage: Follow these instructions for the best results with Persil non bio liquid. Before first use, remove the safety cap by peeling gently towards spout. Dispose of carefully. Pour the correct dosage of Persil liquid into the Stain Eraser Ball (check the product label for full dosing instructions for your load size) and place on top of the clothes in the washing machine drum. Check the garment care labels before selecting the appropriate temperature and wash cycle. Do not use on silk, wool or other delicate fabrics. To pre-treat stains with the Stain Eraser Ball out of the middle of the bottle, pour a small amount of neat liquid detergent into the ball and apply directly to the stain, then rub the area gently with the base of the Stain Eraser Ball to help loosen the stain. After pre-treatment, place the garment in the washing machine with the recommended dosage of Persil liquid.